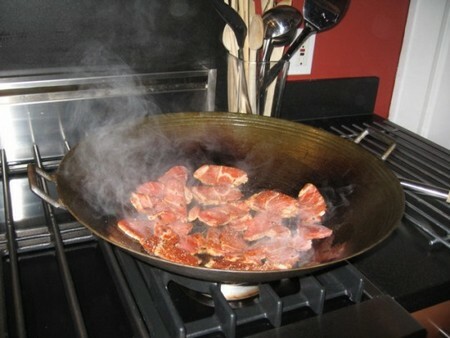 A cast iron wok can be useful in preparing many different foods. It is a necessity for preparing Asian inspired foods and dishes. A wok is a special piece of cookware. It needs to be seasoned properly before one can use it. This seasoning process requires oil and alternating heating and cooling the wok. This will make the oil sticky on the wok so foods do not stick during the cooking process. It also enhances the overall flavor of your food. Ventilate your kitchen area while you ar seasoning the wok. The high heats make cause smoking. You don’t want these smells to get trapped into your walls and furniture. Turn on your stove to high heat setting. Place your wok on the stove’s eye. Allow the wok to heat for several minutes. Remove any objects that could catch fire around the stove. Be careful and mindful as you will be working with high heat. Now, we need to add some oil to the wok. You may use palm oil, peanut oil, corn oil or any other. Brush the oil directly on the surface using a barbecue brush. Palm oil leaves these thickest coating of all the oils. But ou are free to use which ever oil you prefer. While the oil spreads in the hot wok, roll it around by tilting the wok sideways and back. You want to oil to coat the entire inner surface of the wok. Coat thoroughly. Cook the oil for several minutes. Then, turn off your stove top. Allow the hot wok to cool down completely. Wait for the wok to cool to room temperature. Use a paper towel to absorb an excessive oil that may still be in the wok. Turn the stove on high settings again. Heat the wok over the high heat until you can see smoke coming from the wok. Tilt the wok from side to side to spread the oil. Once the oil is cooked in, brush on another thin layer of your oil. Allow the oil to cook in the wok on high for another several minutes. Turn your stove off again. Remove the wok from the direct heat. These steps should be repeated until you can see a dark, slightly sticky oil film forming on the woks surface. Before you heat the wok again, don’t forget to remove ay excess oil with a clean paper towel. After this heating and cooling process, your wok is seasoned and ready to use.